Shirarahama Beach (白良浜) is one of the best white sand beach located in Southern Wakayama Prefecture. It is one of the best beach and the most popular tourist spot for Kinki region people. 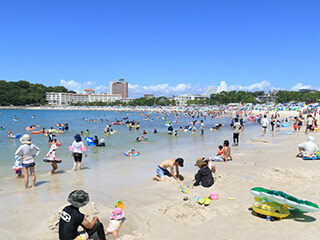 During the summer, about 600,000 people visit and enjoy beach recreations. There are Onsen around this beach as well. There are Foot Onsen on the beach side. There are changing rooms and showers.